Xiaomi Redmi Pro 2 has now purportedly been teased with a Qualcomm Snapdragon 675 SoC. The new model is likely to be the one that was previously teased to sport a 48-megapixel camera sensor. The existence of the Redmi Pro 2 has been suggested through a couple of leaked teasers that have been spotted on Weibo. The smartphone is expected to be the successor to the original Redmi Pro that was launched in China in 2016. The Redmi Pro had debuted with a deca-core Helio X25 SoC and dual rear camera setup. As per the purported teasers that both have been posted by a tipster on Weibo, the Xiaomi Redmi Pro 2 is set to arrive with a Snapdragon 675 SoC. The smartphone also appears to deliver an enhanced photography experience. 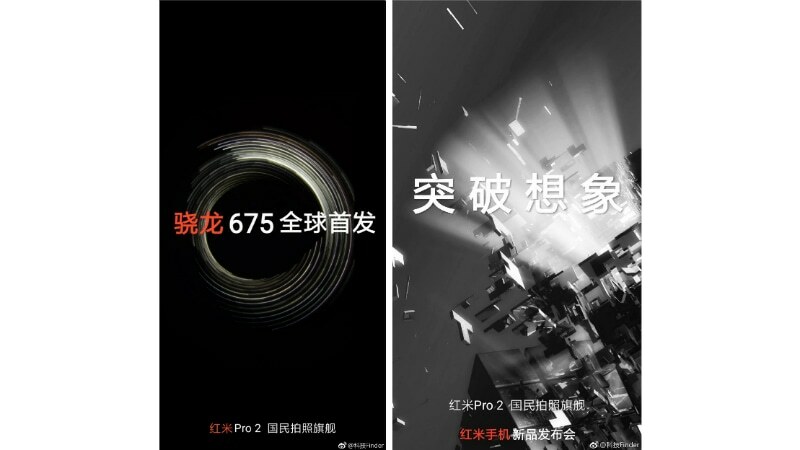 While neither of the two teasers reveals any camera details, the Redmi Pro 2 is expected to be the model that is anticipated with a 48-megapixel camera sensor. The prime reason for the expectation is the presence of the Snapdragon 675 SoC that was previously associated with the imaging-focused smartphone. Xiaomi President Lin Bin earlier this month confirmed the development of the 48-megapixel camera smartphone earlier this month. Also, at the Qualcomm 4G/ 5G Summit in October, Xiaomi Global VP and India Head Manu Kumar Jain suggested the new model by revealing the development of a new model with the Snapdragon 675 SoC. The chipset notably supports up to 48-megapixel camera sensor. Last week, a report from China claimed that the 48-megapixel Xiaomi smartphone will be a part of the new Redmi series. The report also mentioned that the new model will carry a hole in the display to feature a selfie camera alongside offering a nearly full-screen experience. Precisely, the display hole is said to be placed at the top-left side. The placement of the selfie camera position on the upcoming Xiaomi smartphone is likely to be similar to how the Honor View 20 and the Samsung Galaxy A8s feature their frontal cameras. Further, the smartphone is reported to have a chin below the LCD panel and come with glass back. It is also said to be available with a price tag of over CNY 2,000 (roughly Rs. 20,400). To recall, Xiaomi launched the original Redmi Pro in China back in July 2016. The smartphone was the company’s first model to feature a dual rear camera setup that included a 13-megapixel primary sensor along with an f/2.0 aperture and a 5-megapixel depth sensor. The Redmi Pro also had a deca-core MediaTek Helio X25 SoC, coupled with Mali-T880 GPU and up to 4GB RAM.